Correctional officers in Virginia work in a variety of local, federal, and state incarceration and administration facilities. While a majority of the state prisons are state-run, in recent years, government has been trending toward the hire of third-party contractors to manage and oversee prison facilities in the name of efficiency and cost-savings. There are 38 state correctional facilities, 2 federal penitentiaries, and an extensive network of county jails throughout the state of Virginia all of which share resources and communications to ensure the safety of the public. Virginia prison facilities have a range of incarceration options available - some contain a secured space for long-term and violent offenders. Others, like the James River Work Center focus on minimum-security units for inmates. State need and an increasing understanding of what rehabilitation means to offenders, their families, and the community means that staffing needs over the next 10 years are poised to grow at a steady rate (BLS.gov) - in Virginia this means that there will be approximately 650 new positions created for frontline correctional officers; applicants to the field should also be aware that there will be additional roles to fill as existing staff retire, change jobs, or advance their careers. Read more to discover additional points of interest about opportunities in the corrections field below. Bluefield College ranks first in our rankings with thirty-seven students graduating from programs in criminal justice out of a total 402 graduates. 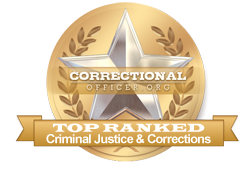 Averett University ranks 2nd in our rankings with eighteen students graduating from programs in corrections and law enforcement administration out of a total 302 students. Virginia State University ranks 3rd in our latest rankings with 111 students graduating from programs in criminal justice and corrections out of a total two thousand students. Virginia Wesleyan College ranks 4th in our rankings with 24 students graduating from programs in criminal justice out of a total 572 students in the 2012-2013 school year. Radford University ranks fifth in our latest rankings with 162 students completing programs in criminalistics and criminal science and criminal justice out of a total 4,464 students in the 2012-2013 school year. Ferrum College ranks 6th in our latest rankings with 17 students graduating from programs in criminal justice out of a total 482 students. Dabney S Lancaster Community College ranks seventh in our rankings with 14 students completing programs in corrections and law enforcement administration out of a total 476 graduates from the 2012-2013 school year. Longwood University ranks 8th in our rankings with 51 students graduating from programs in criminal justice out of a total 2,052 graduates. Wytheville Community College ranks 9th in our latest rankings with forty-four students completing programs in law enforcement administration and corrections out of a total two thousand graduates from the 2012-2013 school year. Mountain Empire Community College ranks tenth in our latest rankings with twenty-eight students completing programs in corrections and law enforcement administration out of a total a thousand students from the 2012-2013 school year. Hiring is conditional upon successful completion of the DOC Basic Training, at which time, candidates will be considered certified corrections officers by the state and may be posted to jobs as vacancies permit. One of the ways that the state of Virginia strives to serve and support correctional officers is through strong working conditions and competitive salaries. Currently, the median income for front-line correctional officers throughout the state is slightly lower at $35,900 than that of the national median income. According to the occupational profile for the state of Virginia, http://www.careerinfonet.org/occ_rep.asp?next=occ_rep&Level=&optstatus=011000000&jobfam=33&id=1&nodeid=2&soccode=333012&menuMode=&stfips=51&x=44&y=13 published by CareerInfoNet.org, state and national trends predict a 13% increase in correctional officer jobs by 2022; that is, the state's growth is more than double that of national growth. For residents of the state, this rate translates into 730 job openings per year. The table below lists career information retrieved from the Bureau of Labor Statistics for correctional officers in Virginia. The table is sorted by total employment, with the largest metropolitan areas listed first.